Thai massage is an ancient ayurvedic healing art. Through application of pressure on the energy lines and points, the body experiences a profound relaxation, peripheral stimulation of the inner organs, increased flexibility and an increased flow of energy. Like yoga you get flexibility, oxygenation of the blood and a quieting of the mind. Through deep muscle stretching, joint release and breathing, the Thai massage offers the same benefits as yoga. 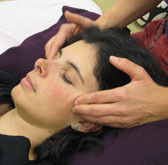 The massage is performed on a futon on the floor with the customer dressed in comfortable clothes. A typical Thai massage is 2 hours covering the whole body. It is a unique massage that transforms the body to a more flexible, relaxed, lighter and less painful state. Prenatal thai massage can be safely experienced from the second trimester onward. The massage is practiced in the side position to allow pressure to be taken of the lower back. Pressing the accupressure points in the feet will start to free the energy lines. The freed energy will stimulate your baby and it will benefit, just as you are, from a relaxing and comforting moment. Thai massage will help with relieving the little aches and pains that come with carrying the extra weight of the baby. It also effectively reduces water retention, improves blood circulation and revitalises your energy. Working mostly in the side position allows for less stress on the lower back. Through gentle stretches and applying pressure on the energylines and points, the body can relax and release tension. Is an aide to the body as an anti-inflammatory, anti-spasmodic, soothes muscle aches & pains, increases circulation, encourages lymphatic drainage and is a tonic (tightens weak connective tissue and strengthens blood vessels). It has many medicinal herbs: dried lemongrass, dried turmeric, dried Thai ginger, dried camphor, dried tamarind leaves and menthol. It is steamed to release the healing properties of the herbs and applied to the skin directly. 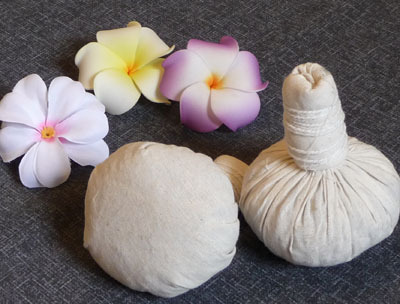 The Herbal compress massage includes some of the traditional Thai massage movements, but there is not as much stretching and pressure being applied. After the treatment you should not shower for at least 2 hours, this will allow the essential oils from the herbs to penetrate the skin more deeply. It is also a good idea to foresee a break of at least one hour after the massage where you can relax. Chi Nei Tsang (abdominal massage) is a massage which helps to unblock energy and through that restores and balances vitality. Chi Nei Tsang detoxifies and tonifies the skin, cleans the lymphatique system and balances the circulatory system. The digestive system is stimulated. It also helps with menstrual pains. Changes are felt quickly and the results are durable. This abdominal massage works with a gentle and deep touch, so that the internal organs learn how to work better; as well as all the other vital systems of the body: digestion, respiration, cardio-vascular, lymphatique, nervous, endocrine, urinary, reproductive and muscular. The emotional holdings are also approached in this way and slowly digested. The bellybutton, its roots and its surroundings reflect the internal and external tensions of the body. Please do not eat for at least 2 hours before receiving an internal organ massage.